BOSTON – It was the dawn of a new century, featuring larger-than-life cultural icons such as Harry Houdini, Henry Ford, Booker T. Washington and vaudeville star Evelyn Nesbit. It also marked the birth of a new genre of music – the rag, made popular by musicians such as Scott Joplin. But it was also a time of blatant racism and teeming tenements of starving immigrants trying to cash in on the promise of the American Dream. 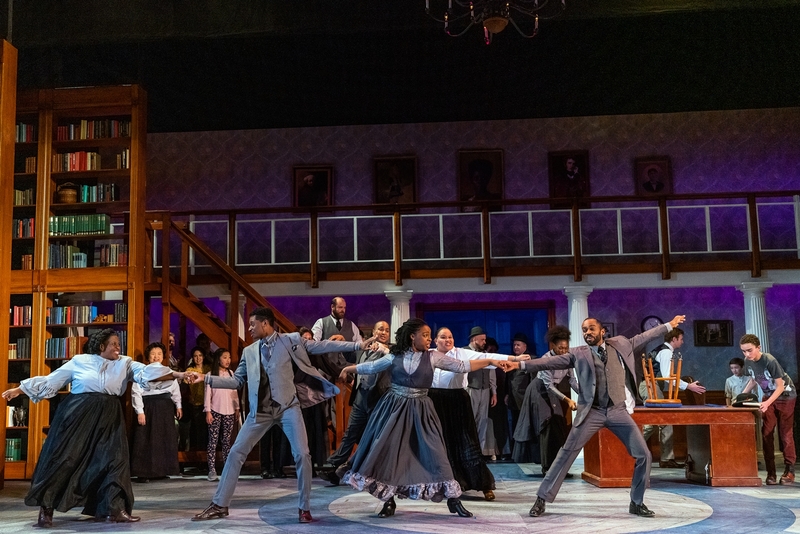 The musical “Ragtime” is the story of attitudes and prejudices that helped shape us as people, and how those attitudes and prejudices have played themselves out over history, using a time early in the 20th Century as an example. It’s all part of the fabric of the Tony Award-winning musical from the team of lyricist Lynn Ahrens and composer Stephen Flaherty, now being performed through Feb. 17 at the Wheelock Family Theatre at Boston University. “Ragtime,” with a book by Terrence McNally based on the novel by E.L. Doctorow, was nominated for 13 Tonys and won several, but was beaten out by “The Lion King” for Best Musical. It is a sprawling, epochal piece requiring a large cast – Wheelock has employed a diverse group of 28 actors and actresses – with several actors playing multiple parts as well as serving as part of the ensemble. Alas, where this “Ragtime” falls short is in the performance of the Ahrens-Flaherty score, one of the finest of the last quarter century. The orchestrations were done by Kim Scharnberg for the nine-piece orchestra led by pianist/conductor Jon Goldberg. The synthesizer is listed as one of the instruments, which usually means it is filling in the gaps for the smaller number of players. The resulting sound is often tinny and the sweep and majesty of such numbers as “Journey On,” “Wheels of a Dream” and “Back to Before” are lost in the process. It’s not a comment on the musicians themselves but the limitations of playing this score with fewer pieces than usual. That, in turn, makes for a domino effect that makes the vocal performances a bit less than they would be otherwise. 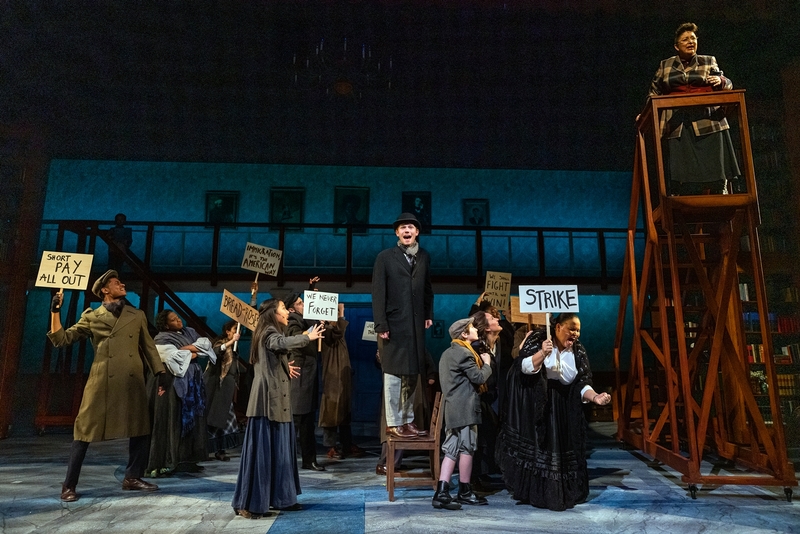 Still, there are some fine performances and the energy and enthusiasm of the cast makes for a skilled re-telling of the story of three very different groups of people and how their lives intersect at the turn of the 20th Century. 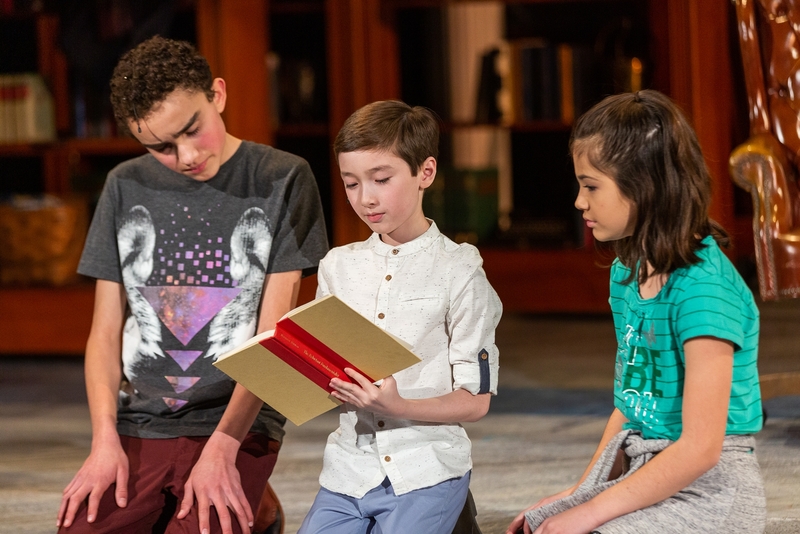 Director Nick Vargas has also slightly retooled the piece; in the WFT’s production, the events of the musical are seen through the eyes of its youngest characters, including Edgar (Ben Choi-Harris), the young boy whose words begin and end the show. Before the play begins, a boy and girl playing in a library and a book is knocked from the shelf – Doctorow’s “Ragtime” – and the children imagine the characters coming to life in the play. In an interview, Vargas said he hoped the sequence would help the play resonate with children. In Choi-Harris and Marissa Simequi, Wheelock has enlisted two of the most talented young performers in the area. As “Ragtime” opens, three groups of people are warily circling each other on stage: A privileged white family from New Rochelle, N.Y., for whom every day is “sunny and bright”; a group of African-American residents of Harlem, for whom life is less sunny; and a group of poor immigrants, dressed in shabby rags, clutching their meager possessions. Their lives will intersect in many ways, and by the end of that first number they have coalesced into one group, the American “melting pot” doing its work. Anthony Pires Jr. and Pier Lamia Porter certainly have the voices to portray musician-turned-revolutionary Coalhouse Walker Jr. and Sarah, his doomed girlfriend and the mother of their son. Coalhouse, riding proudly in his Model T, envisions a promising future for his family, but racist vandalism and Sarah’s death at the hands of brutal police wrecks those dreams. Wheelock was and continues to be a pioneer in the area of non-traditional casting. But just as traditional casting doesn’t always work, non-traditional casting isn’t a guarantor of success, and actress Lisa Yuen doesn’t quite ring true as Mother, the matriarch of the white, wealthy WASPish family living in upscale, suburban New Rochelle, N.Y. It is a home where Mother grows ever distant from her world-traveling husband (Peter S. Adams). Her decision to take in both Sarah and Sarah’s young son is yet another source of friction, especially when Coalhouse comes to court Sarah just as Father is arriving home. Adams has performed the role of Father on a national tour and in other local productions and he captures the attitude of the time that the man’s place is not only to manage his own life and career and satisfy his every whim, but also to control the lives of other family members: Read Mother. A key character is the widower immigrant Tateh (Tony Castellanos), who arrives in America at the exact moment that Father is off to the North Pole, clinging to his little girl (Marissa Simeqi) with all his life. He promises her a new life but finds only despair and starvation until his own ingenuity and opportunity combine to lift him to the forefront of a completely new industry. Amidst it all, another immigrant named Harry Houdini ( Brad Foster Reinking) is amazing the masses, Henry Ford (Daniel Forest Sullivan) is selling Model T’s to the average man and Booker T. Washington (Davron S. Monroe) is counseling his fellow blacks to lift themselves up. Jonathan Acorn brings the requisite passion to the role of Younger Brother, Mother’s brother who after an early infatuation with vaudevillian Evelyn Nesbit (Tara Deieso) finds himself repulsed at Father’s politics and follows his heart to the teachings of Emma Goldman. As Goldman, Nicole Paloma Sarro could be even more ethnic and passionate in her portrayal of immigrant Russian Jew Emma Goldman, the firebrand anarchist who rallied downtrodden workers against business tycoons such as J.P. Morgan (Robert Saoud) before being arrested and deported. The ensemble features seasoned, strong-voiced talent such as Carolyn Saxon and Yewande Odetoyinbo along with other younger talent that gives and energetic lift to Nailah Randall-Bellinger’s choreography. Set designer Lindsay Genevieve Fuori’s set morphs from what begins as a large library with portable stairways with podiums at the top which move about the stage depending on the scene. A second tier to the set in the rear allows greater freedom. Director Vargas also positions actors in the middle of the audience in some scenes in an effective effort to draw the audience ever closer. “Ragtime,” which wears its heart on its sleeve at all times, is one of the great musicals in recent memory, and WFT is offering a child-friendly opportunity to explore its themes, which are as relevant today as they were when Henry Ford was first putting the common man on the road in a Model T.
The Wheelock Family Theatre production of “Ragtime.” Music and lyrics by Stephen Flaherty and Lynn Ahrens. Book by Terence McNally, based on the novel by E.L. Doctorow. Directed by Nick Vargas. Set design by Lindsay Genevieve Fuori. Music director Jon Goldberg. Choreography by Nailah Randall-Bellinger. Lighting design by Aja M. Jackson. Costume design by Zoe Sundra. Sound design by B.C. Williams. Through Feb. 17. wheelockfamilytheatre.org.